The adrenal (or suprarenal) glands are paired endocrine glands situated over the medial aspect of the upper poles of each kidney. They secrete steroid and catecholamine hormones directly into the blood. 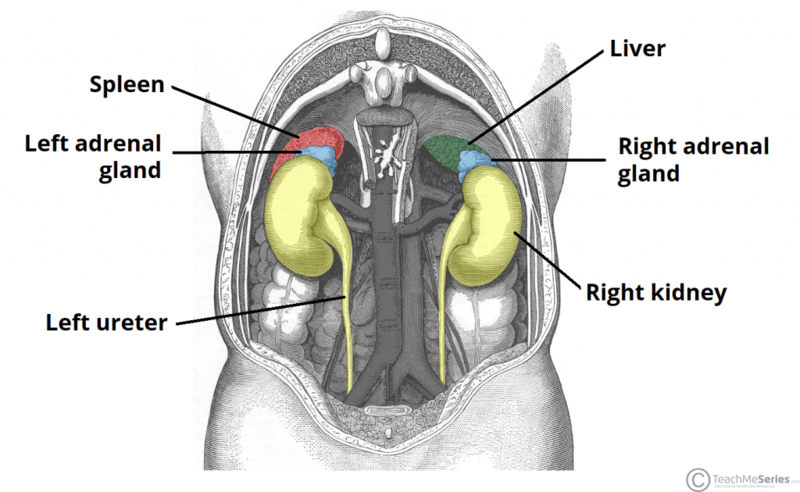 In this article, we shall look at the anatomy of the adrenal glands – their location, structure and vascular supply. 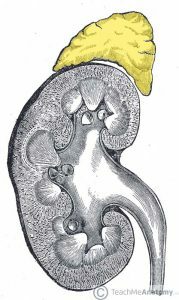 Fig 1 – The right adrenal gland, situated over the medial aspect of the upper pole of the right kidney. The adrenal glands are located in the posterior abdomen, between the superomedial kidney and the diaphragm. They are retroperitoneal, with parietal peritoneum covering their anterior surface only. The right gland is pyramidal in shape, contrasting with the semi-lunar shape of the left gland. Perinephric (or renal) fascia encloses the adrenal glands and the kidneys. This fascia attaches the glands to the crura of the diaphragm. 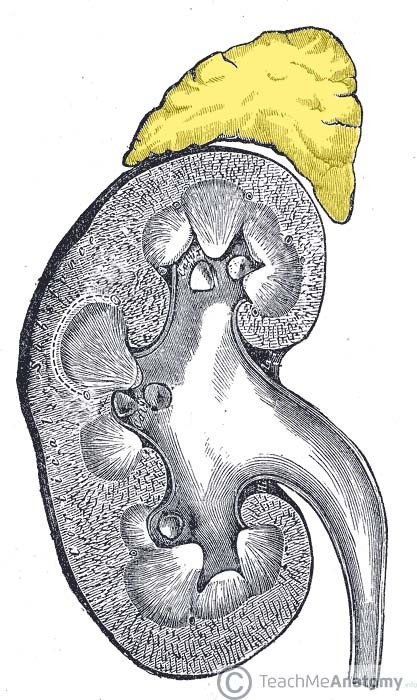 They are separated from the kidneys by the perirenal fat. Fig 2 – Posterior view of the abdomen, demonstrating the anatomical relations of the adrenal glands. The adrenal glands consist of an outer connective tissue capsule, a cortex and a medulla. Veins and lymphatics leave each gland via the hilum, but arteries and nerves enter the glands at numerous sites. 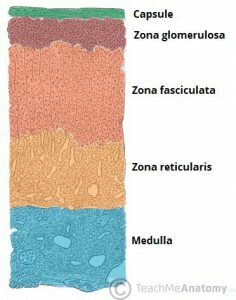 Cortex – derived from the embryonic mesoderm. 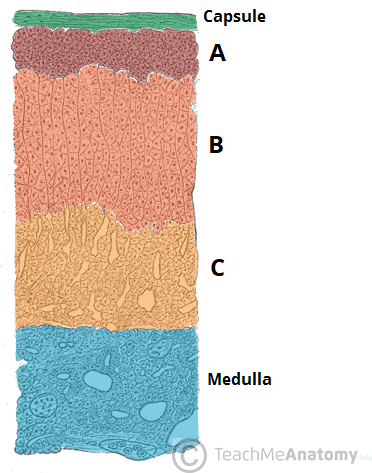 Medulla – derived from the ectodermal neural crest cells. The cortex and medulla synthesise different hormones. Zona glomerulosa – produces and secretes mineralocorticoids such as aldosterone. Zona fasciculata – produces and secretes corticosteroids such as cortisol. It also secretes a small amount of androgens. Zona reticularis – produces and secretes androgens such as dehydroepiandrosterone (DHES). It also secretes a small amount of corticosteroids. Fig 3 – Histological appearance of the cortex and medulla of the adrenal gland. The medulla lies in the centre of the gland, and is dark brown in colour. It contains chromaffin cells, which secrete catecholamines (such as adrenaline) into the bloodstream in response to stress. These hormones produce a ‘flight-or-fight‘ response. Chromaffin cells also secrete enkephalins which function in pain control. Middle adrenal artery – arises from the abdominal aorta. Inferior adrenal artery – arises from the renal arteries. 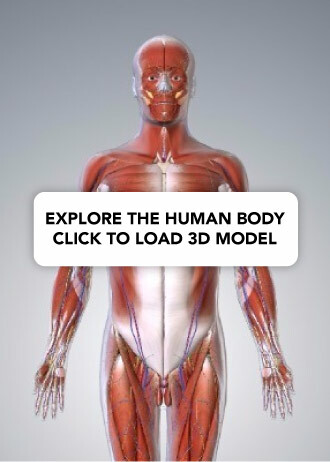 Right and left adrenal veins drain the glands. The right adrenal vein drains into the inferior vena cava, whereas the left adrenal vein drains into the left renal vein. The adrenal glands are innervated by the coeliac plexus and abdominopelvic splanchnic nerves. Sympathetic innervation to the adrenal medulla is via myelinated pre-synaptic fibres, mainly from the T10 to L1 spinal cord segments. Lymph drainage is to the lumbar lymph nodes by adrenal lymphatic vessels. These vessels originate from two lymphatic plexuses – one deep to the capsule, and the other in the medulla. A pheochromocytoma is a tumour of the adrenal medulla or preganglionic sympathetic neurones. It secretes adrenaline and noradrenaline uncontrollably, causing blood pressure to greatly increase. Patients may present with palpitations, headaches and diaphoresis (profuse sweating). Phenoxybenzamine, a competitive, irreversible antagonist of adrenaline, can be used in treatment to reduce blood pressure by binding to adrenaline receptors, making less available for adrenaline to act upon. 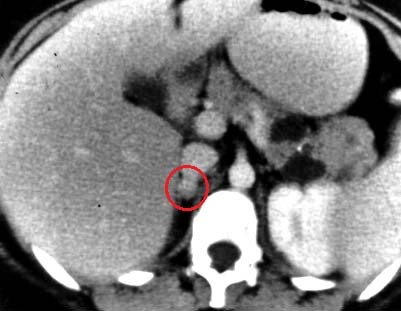 Fig 4 – CT scan of a pheochromocytoma. Which of the following best describes the shape of the left adrenal gland? What is the embryonic origin of the adrenal cortex? In the illustration below, which area of the adrenal gland produces cortisol?